I LOVE that you all have opinions. I loathe fence riders and you certainly let me know! Some of you are staunch real crab meat lovers and some like imitation, a few don't mind either. I am a real crab only girl and I don't like it mixed with anything. It is such a sweet, delicate flavor I don't want anything to ruin it for me! 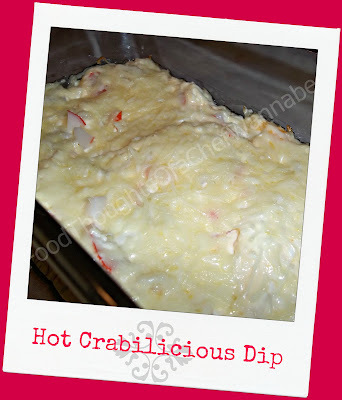 My husband, a coast boy, who loves almost all seafood, also occassionally enjoys imitation crab meat. I know in small towns and rural areas, you are lucky to even find the imitation! I loathe canned crab. Ack! So hubby got sent to the store, and if you have followed me for awhile you know how a trip for 2 things turns into a 100.00 shopping trip. Friday was no exception. He found some imitation crab meat and bought it because, ya know, he thought I might "make me a hot dip for while we have some drinks". Of course darling, I would LOVE to. Does your husband ever do that? Mine does and even though he wasn't sure what would be in said dip, he brought home a few things I could add and had some idea's on where I should go with this recipe. I mean, of course he would have an opinion! He ALWAYS has one! That is what I love about him. Umm...right? HA! I am sure this is really a pretty standard recipe. I am likely not the first person to come up with it, however, it is just what I had in the fridge that I thought might work. It did and he loved it! I made a half recipe but I will give you the full recipe amounts. I would use an 8x8 or 9x9 casserole to bake it in! Dip bagel chips, pita crisps, or crackers! The choice is yours and the choices are endless! Preheat your oven to 350 degrees! In a small bowl combine cream cheese, Hellmanns, crab meat, hot sauce, pepper and half of the cheese. Spread into a baking dish 8x8 or similiar. Spread evenly, and then sprinkle remaining cheese on top. Bake for 30 minutes. Make sure to check at 20 and make sure it is bubbling and the cheese is melted! Garnish with chopped parsley or green onion if you prefer! Serve with your choice of crackers or crisps or chips!